Chemical formula of C16H13ClN2O Molecular mass 284.7 g/mol first marketed as Valium by Hoffmann-La Roche, is a benzodiazepine derivative drug. It possesses anxiolytic, anticonvulsant, sedative, skeletal muscle relaxant and amnestic properties. It is commonly used for treating anxiety, insomnia, seizures, alcohol withdrawal, and muscle spasms. It may also be used before certain medical procedures (such as endoscopies) to reduce tension and anxiety, and in some surgical procedures to induce amnesia. Diazepam is a core medicine in the World Health Organization's "Essential Drugs List", which is a list of minimum medical needs for a basic health care system. Diazepam is used to treat a wide range of conditions and has been one of the most frequently prescribed medications in the world for the past 40 years. It was invented by Dr. Leo Sternbach. Diazepam was the second benzodiazepine to be invented by Sternbach of Hoffmann-La Roche, and was approved for use in 1963. It is two and a half times more potent than its predecessor, chlordiazepoxide, which it quickly surpassed in terms of sales. After this initial success, other pharmaceutical companies began to introduce other benzodiazepine derivatives. The benzodiazepines gained popularity among medical professionals as an improvement upon barbiturates, which have a comparatively narrow therapeutic index, and are far more sedating at therapeutic doses. The benzodiazepines are also far less dangerous; death rarely results from diazepam overdose, except in cases where it is consumed with large amounts of other depressants (such as alcohol or other sedatives). Diazepam was the top-selling pharmaceutical in the United States from 1969 to 1982, with peak sales in 1978 of 2.3 billion tablets. Diazepam along with oxazepam, nitrazepam and temazepam represent 82% of the benzodiazepine market in Australia. While psychiatrists continue to prescribe diazepam for the short-term relief of anxiety, neurology has taken the lead in prescribing diazepam for the palliative treatment of certain types of epilepsy and spastic activity, e.g., forms of paresis. It is also the first line of defense for a rare disorder called stiff-person syndrome.. Diazepam is also found in nature. Several plants, such as potato and wheat, contain trace amounts of naturally occurring diazepam and other benzodiazepines. Diazepam occurs as solid white or yellow crystals and has a melting point of 131.5 to 134.5 Â°C. It is odorless, and has a slightly bitter taste. The British Pharmacopoeia lists diazepam as being very slightly soluble in water, soluble in alcohol and freely soluble in chloroform. The United States Pharmacopoeia lists diazepam as soluble 1 in 16 of ethyl alcohol, 1 in 2 of chloroform, 1 in 39 of ether, and practically insoluble in water. The pH of diazepam is neutral (i.e. pH = 7). Diazepam has a shelf-life of 5 years for oral tablets and 3 years for IV/IM solution. Diazepam is structurally related to quinazolines and is a hapten. Diazepam is a "classical" benzodiazepine, other classical benzodiazepines include; clonazepam, lorazepam, oxazepam, nitrazepam, flurazepam, bromazepam and clorazepate. Diazepam and other benzodiazepines may influence neurosteroid metabolism and progesterone levels which in turn may adversely influence the functions of the brain and reproductive system. The pharmacological actions of benzodiazepines at the GABAa receptor are similar to those of neurosteroids. Neuroactive steroids are positive allosteric modulators of the GABAa receptor, enhancing GABA function. Many benzodiazepines (diazepam, medazepam, estazolam, flunitrazepam and nitrazepam) potently inhibit the enzymes involved in the metabolism of neurosteroids. Long-term administration of benzodiazepines may influence the concentrations of endogenous neurosteroids, and thereby would modulate the emotional state. Factors which affect benzodiazepines ability to alter neurosteroid levels depend on the molecular make up of the individual benzodiazepine molecule. Presence of a substituent at N1 position of the diazepine ring and/or the chloro or nitro group at position 7 of the benzene ring contribute to potent inhibition of the isoenzymes, and in turn a bromo group at position 7 (for bromazepam) and additional substituents (3-hydroxy group for oxazepam and tetrahydroxazole ring for cloxazolam and oxazolam) decrease the inhibitory potency of benzodiazepines on neurosteroids. Diazepam binds with high affinity to glial cells.[14. Diazepam is a benzodiazepine that binds to a specific subunit on the GABAA receptor at a site that is distinct from the binding site of the endogenous GABA molecule.The GABAA receptor is an inhibitory channel which, when activated, decreases neurologic activity. Due to the role of diazepam as a positive allosteric modulator of GABA, when it binds to benzodiazepine receptors it causes inhibitory effects. This arises from the hyperpolarization of the post-synaptic membrane, due to the control exerted over negative chloride ions by GABAA receptors. Benzodiazepines including diazepam however, do not have any affect on the levels of GABA in the brain. Diazepam appears to act on areas of the limbic system, thalamus and hypothalamus, inducing anxiolytic effects. Its actions are due to the enhancement of GABA activity. Benzodiazepine drugs including diazepam increase the inhibitory processes in the cerebral cortex. The anticonvulsant properties of diazepam and other benzodiazepines may be in part or entirely due to binding to voltage-dependent sodium channels rather than benzodiazepine receptors. Sustained repetitive firing seems to be limited by benzodiazepines effect of slowing recovery of sodium channels from inactivation. The muscle relaxant properties of diazepam are produced via inhibition of polysynaptic pathways in the spinal cord. When diazepam is administered orally, it is rapidly absorbed and has a fast onset of action. The onset of action is 1-5 minutes for IV administration and 15-30 minutes for IM administration. The duration of diazepam's peak pharmacological effects is 15 minutes to 1 hour for both routes of administration.. Peak plasma levels are achieved 30 minutes to 2 hours after oral administration. When diazepam is administered as an intramuscular injection, absorption is slow, erratic and incomplete. Diazepam is highly lipid-soluble, and is widely distributed throughout the body after administration. It easily crosses both the blood-brain barrier and the placenta, and is excreted into breast milk. After absorption, diazepam is redistributed into muscle and adipose tissue. Continual daily doses of diazepam will quickly build up to a high concentration in the body (mainly in adipose tissue), which will be far in excess of the actual dose for any given day.. There is preferential storage of diazepam in some organs including the heart. Absortion by any administered route and the risk of accumulation is significantly increased in the neonate and there is clinical justification to recommend the withdrawal of diazepam during pregnancy and breast feeding.. Diazepam is metabolised via oxidative pathways in the liver via the cytochrome P450 enzyme system. It has a biphasic half-life of 1-2 and 2-5 days, and has several pharmacologically active metabolites. The main active metabolite of diazepam is desmethyldiazepam (also known as nordazepam or nordiazepam). Diazepam's other active metabolites include temazepam and oxazepam. These metabolites are conjugated with glucuronide, and are excreted primarily in the urine. Because of these active metabolites, the serum values of diazepam alone are not useful in predicting the effects of the drug. Diazepam is mainly used to treat anxiety, insomnia, and symptoms of acute alcohol or opiate withdrawal. It is also used as a premedication for inducing sedation, anxiolysis or amnesia prior to certain medical procedures (e.g. endoscopy).. Diazepam is rarely used for the long-term treatment of epilepsy. This is due to the fact that tolerance to the anticonvulsant effects of diazepam usually develops within 6 to 12 months of treatment, effectively rendering it useless for this purpose and also due to side effects - in particular sedation.. Diazepam has a broad spectrum of indications (most of which are off-label), including: treatment of anxiety, panic attacks, and states of agitation ; treatment of status epilepticus, adjunctive treatment of other forms of epilepsy ; treatment of the symptoms of alcohol and opiate withdrawal ; short-term treatment of insomnia ; treatment of tetanus, together with other measures of intensive-treatment ; initial management of mania, together with firstline drugs like lithium, valproate or other antipsychotics; adjunctive treatment of painful muscle conditions ; adjunctive treatment of spastic muscular paresis (para-/tetraplegia) caused by cerebral or spinal cord conditions such as stroke, multiple sclerosis, spinal cord injury (long-term treatment is coupled with other rehabilitative measures) ; palliative treatment of stiff person syndrome ; used to alleviate the symptoms of Lesch-Nyhan Syndrome ; pre-/postoperative sedation, anxiolysis and/or amnesia (e.g. before endoscopic or surgical procedures) ;treatment of overdosage with hallucinogens or CNS stimulants ; adjunctive treatment of drug-induced seizures, resulting from exposure to sarin, VX, soman (or other organophosphate poisons; See CANA), lindane, chloroquine, physostigmine, or pyrethroids ; emergency treatment of eclampsia, along with IV magnesium sulfate ; prophylactic treatment of oxygen toxicity during hyperbaric oxygen therapy. used in the treatment for irritable bowel syndrome. ; and used to treat pain resulting from muscle spasms caused by various spastic dystonias, including blepharospasm, spasmodic dysphonia and Meige's Syndrome. Diazepam has a range of side effects which are common to most benzodiazepines. Most common side effects include: somnolence ; suppression of REM sleep; addiction ; impaired motor function ; impaired coordination; impaired balance; dizziness and nausea ; depression ; impaired learning; anterograde amnesia (especially pronounced in higher doses) ; cognitive deficits ; reflex tachycardia ; rare paradoxical side effects can include: nervousness, irritability, insomnia, muscle cramps, and in extreme cases, rage, and violence. If these side effects are present, diazepam treatment should be immediately terminated. Benzodiazepines such as diazepam impair learning and memory via their action on benzodiazepine receptors which causes a dysfunction in the cholinergic neuronal system. Diazepam may impair the ability to drive vehicles or operate machinery. The impairment is worsened by consumption of alcohol, because both act as central nervous system depressants.. During the course of therapy, tolerance to the sedative effects usually develops, but not to the anxiolytic and myorelaxant effects.. Patients with severe attacks of apnea during sleep may suffer respiratory depression (hypoventilation) leading to respiratory arrest and death. Organic changes such as leukopenia and liver-damage of the cholostatic type with or without jaundice (icterus) have been observed in a few cases. Diazepam in doses of 5 mg or more causes significant deterioration in vigilance performance combined with increased feelings of sleepiness. Diazepam. PubChem. National Institute of Health: National Library of Medicine (2006). Diazepam. Medical Subject Headings (MeSH). National Library of Medicine (2006). WHO Model List of Essential Medicines (PDF). World Health Organization (March 2005). Sample, Ian. "Leo Sternbach's Obituary", The Guardian (Guardian Unlimited), Monday October 3, 2005. Barondes, Samuel H. (2003). Better Than Prozac. New York: Oxford University Press, 47-59. Mant A; Whicker SD, McManus P, Birkett DJ, Edmonds D, Dumbrell D. (Dec 1993). "Benzodiazepine utilisation in Australia: report from a new pharmacoepidemiological database.". Aust J Public Health. 17 (4): 345-9. PMID 7911332. Diazepam: indications. Rxlist.com. RxList Inc. (January 24, 2005). Wildmann J, Vetter W, Ranalder UB, Schmidt K, Maurer R, Mohler H (1988). "Occurrence of pharmacologically active benzodiazepines in trace amounts in wheat and potato". Biochem Pharmacol 37 (19): 3549-59. PubMed. Retrieved on 2006-04-12. Pere Munne/M. Ruse, Ed. (1990/1998 Ed.). Diazepam. Inchem.org. Inchem.org. Earley JV; Fryer RI, Ning RY. (Jul 1979). "Quinazolines and 1,4-benzodiazepines. LXXXIX: Haptens useful in benzodiazepine immunoassay development.". J Pharm Sci. 68 (7): 845-50. PMID 458601. Mikota, Susan K. and Plumb, Donald C. (2005). Diazepam. The Elephant Formulary. Elephant Care International. Braestrup C; Squires RF. (Apr 1978). "Pharmacological characterization of benzodiazepine receptors in the brain.". Eur J Pharmacol 48 (3): 263-70. PMID 639854. Usami N; Yamamoto T, Shintani S, Ishikura S, Higaki Y, Katagiri Y, Hara A. (Apr 2002). "Substrate specificity of human 3(20)alpha-hydroxysteroid dehydrogenase for neurosteroids and its inhibition by benzodiazepines." (pdf). Biol Pharm Bull. 25 (4): 441-5. PMID 11995921. Gallager DW; Mallorga P, Oertel W, Henneberry R, Tallman J (Feb 1981). "[3HDiazepam binding in mammalian central nervous system: a pharmacological characterization]". J Neurosci 1 (2): 218-25. PMID 6267221. Matthew E; Laskin JD, Zimmerman EA, Weinstein IB, Hsu KC, Engelhardt DL (Jun 1981). "Benzodiazepines have high-affinity binding sites and induce melanogenesis in B16/C3 melanoma cells". Proc Natl Acad Sci U S A 78 (6): 3935-9. PMID 6267610. Oishi R; Nishibori M, Itoh Y, Saeki K. (27). "Diazepam-induced decrease in histamine turnover in mouse brain.". Eur J Pharmacol. 124 (3): 337-42. PMID 3089825. Grandison L (1982). "Suppression of prolactin secretion by benzodiazepines in vivo". Neuroendocrinology 34 (5): 369-73. PMID 6979001. Holmes JH; Kanfer I, Zwarenstein H. (Aug 1978). 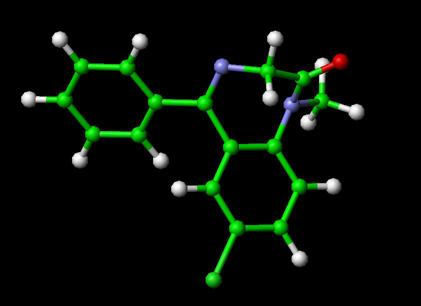 "Effect of benzodiazepine derivatives on human blood cholinesterase in vitro.". Res Commun Chem Pathol Pharmacol 21 (2): 367-70. PMID 29327. Sieghart, W. (January 1994). "Pharmacology of benzodiazepine receptors: an update". Journal of Psychiatry and Neuroscience 19 (1): 24-29. PubMed. Thomson Healthcare (Micromedex) (March 2000). Diazepam. Prescription Drug Information. Drugs.com. Varotto M; Roman G, Battistin L (30 Apr 1981). "[Pharmacological influences on the brain level and transport of GABA. I) Effect of various antipileptic drugs on brain levels of GABA]". Boll Soc Ital Biol Sper 57 (8): 904-8. PMID 7272065. Zakusov VV; Ostrovskaya RU, Kozhechkin SN, Markovich VV, Molodavkin GM, Voronina TA. (Oct 1977). "Further evidence for GABA-ergic mechanisms in the action of benzodiazepines." 229 (2): 313-26. PMID 23084. McLean MJ; Macdonald RL. (Feb 1988). "Benzodiazepines, but not beta carbolines, limit high frequency repetitive firing of action potentials of spinal cord neurons in cell culture.". J Pharmacol Exp Ther. 244 (2): 789-95. PMID 2450203. Date SK; Hemavathi KG, Gulati OD. (Nov 1984). "Investigation of the muscle relaxant activity of nitrazepam.". Arch Int Pharmacodyn Ther. 272 (1): 129-39. PMID 6517646. Langsam, Yedidyah. DIAZEPAM (VALIUM AND OTHERS). Brooklyn College (Eilat.sci.Brooklyn.CUNY.edu). Olive G; Dreux C. (Jan 1977). "Pharmacologic bases of use of benzodiazepines in perÃ©inatal medicine.". Arch Fr Pediatr. 34(1): 74-89. PMID 851373. Oelschlager H. (4). "[Chemical and pharmacologic aspects of benzodiazepines]". Schweiz Rundsch Med Prax. 78 (27-28): 766-72. PMID 2570451. Vozeh S. (21). "[Pharmacokinetic of benzodiazepines in old age]". Schweiz Med Wochenschr. 111 (47): 1789-93. PMID 6118950. Isojarvi, JI; Tokola RA. (Dec 1998). "Benzodiazepines in the treatment of epilepsy in people with intellectual disability.". J Intellect Disabil Res. 42 (1): 80-92. PMID 10030438. Okoromah, C. N.; F. E. Lesi (2004). "Diazepam for treating tetanus". Cochrane database of systematic reviews (Online) (1). PubMed. (1999) Hyperbaric Medicine Practice, Second Edition. Best Publishing Company. Hines, Ron DVM PhD (January 14, 2006). Epilepsy In Your Dog Or Cat. 2nd Chance Sanctuary Pet Health Center. Diazepam: description. Rxlist.com. RxList Inc. (January 24, 2005). Kaewnopparat, N., Kaewnopparat, S., Rojanarat, W., Ingkatawornwong, S. (July/August 2004). "Enhanced Release of Diazepam From Hollow-Type Suppositorie". International Journal of Pharmaceutical Compounding. Jones DM; Jones ME, Lewis MJ, Spriggs TL. (May 1979). "Drugs and human memory: effects of low doses of nitrazepam and hyoscine on retention.". Br J Clin Pharmacol. 7 (5): 479-83. PMID 475944. Marrosu, F.; G. Marrosu, M. G. Rachel, G. Biggio (July-September 1987). "Paradoxical reactions elicited by diazepam in children with classic autism.". Functional Neurology 2 (3): 355-361. PubMed. Retrieved on 2006-09-24. Diazepam: Side Effects. RxList.com. Retrieved on September 26, 2006. Michel, L.; J. P. Lang (November-December 2003). "Benzodiazepines et passage Ã l'acte criminel / Benzodiazepines and forensic aspects". L'Encephale 29 (6): 479-85. PubMed. Nabeshima T; Tohyama K, Ichihara K, Kameyama T. (Nov 1990). "Effects of benzodiazepines on passive avoidance response and latent learning in mice: relationship to benzodiazepine receptors and the cholinergic neuronal system.". J Pharmacol Exp Ther. 255 (2): 789-94. PMID 2173758. Hriscu, A.; F. Gherase, V. Nastasa, and E. Hriscu (October-December 2002). "[An experimental study of tolerance to benzodiazepines]". Revista Medico-ChirurgicalÄƒÌ† Societe de MediciNatural 106 (4): 806-811. PubMed. Haerten, K.; W. Pottgen "[Leukopenia following benzodiazepine derivatives]". Die Medizinische Welt 26 (38): 1712-1714. PubMed. Kozena L; Frantik E, HorvÃ¡th M. (May 1995). "Vigilance impairment after a single dose of benzodiazepines.". Psychopharmacology (Berl). 119 (1): 39-45. PMID 7675948.